(CHARLESTOWN,NEVIS-WEDNESDAY, March 2nd, 2011) Before a packed audience at the 2011 Nevis Reformation Party (NRP) Convention, Premier of Nevis, the Hon. 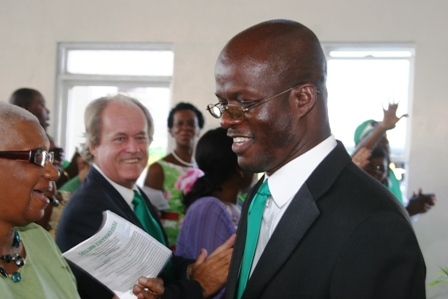 Joseph Parry commended Attorney General of St. Kitts- Nevis, the Hon. Patrice Nisbett for a job well done and the high level of performance he has displayed since his appointment to the position one year ago. “I am proud of the actions and tenacity of the Hon. 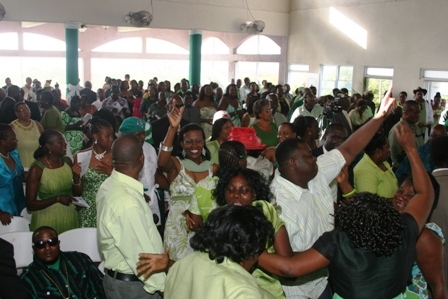 Patrice Nisbett, as he has proven that Performance Matters,” said Premier Parry at the function on Sunday. It was held at the Occasions Event Center at Pinneys. It was noted by the Premier, that Hon. Nisbett was instrumental in drafting the Law regulating Geothermal and Small Business Development. But Mr. Parry explained that Mr. Nisbett came into his own when he became the Attorney General following the Federal Election of 2010. “Yes we (the NRP) were and are still being criticized for recommending Patrice Nisbett who sits in the Cabinet of the Labour Government on St. Kitts. On the one hand we say we want to see Nevis progress, yet every move is met with a barrage of criticism and a blanket of resistance,” said the Premier. 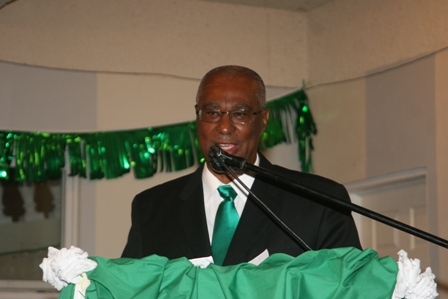 During the Premiers presentation, he noted that Mr. Nisbett was in the right position at the right time, when Nevis needed him most. The Premier reminisced on the Four Seasons battle and said that if it had not been for the assistance of Prime Minister Douglas, the Attorney General and the timely intervention of Mr. Gossai Crown Counsel to the Federal Government, who was sent to Delaware to give evidence on behalf of Nevis, the Resort might not have been open today. In addition, Premier Parry discussed the recent collection of Corporate Taxes into the Nevis Treasury, which he said was done by consultation not confrontation. “The Corporate taxes are collected on Nevis and the negotiations for this were mature and peaceful. How many of us remember that in 1997, it led to a Referendum for Secession and to bitter verbal battles between the people of Nevis and the people of St. Kitts. Patrice’s presence on St. Kitts was instrumental in easing this matter to a successful conclusion. Indeed we must say, performance matters,” stated Mr. Parry. He added that without hard work and great performance, how else could his government have taken Nevis from a position of economic meltdown to where it is today? The Hon. Patrice Nisbett, according to the Premier, ensured that Clear Harbour Communications which employed less than 12 persons under a different ownership when the NRP took office, was taken to court on behalf of the people of Nevis. Today, a company called Brown Hill Communications Centre, signed contracts with the Nevis Island Administration under the direction and advice of the Hon. Patrice Nisbett and the facility now employs 182 persons and is in the process of expanding to employ an additional 100 within a year.